To next gen or not? So I was at work and we were just chatting about games and gaming when the question was asked of me, “what next gen console do you own?”. I replied with “none” and I got looks from my work colleagues as if I just insulted all their mothers with a bad “yo momma” joke from the early 90’s. Yes that is right, I do not own any of the next gen machines…why is this such a taboo? I mean, go onto any gaming website/forum and just talk about the fact you do not own a next gen console, and you’ll be greeted with abuse and insults. Money: It’s not that I can not afford one, more a case of there are other things I would rather spend my money on. As of now you are looking at around £300 for one of the new consoles with a game bundled in. Then I’d need other games to play as one is not enough, so we are looking at £450-ish. Plus there is the fact another controller would be required which sell for around £40 right now, batteries and charger for the controllers which go for about £30. So even just to start up I’m looking at roughly £490…and to be honest there are other things I’d rather spend that money on. Oh I could go out right now and buy myself a shiny new Xbox One, but close to £500 just to get started is just not worth it. 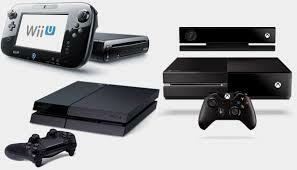 Games: In all honesty there is NOTHING I really want to play on any of the next gen machines, Not on the Xbox One, Playstation 4 or even the (cheaper) Wii U offer anything I am interested in. The only games so far that pique my interest are remasters of games I already own and have played on the last gen and I’m not paying again for a game I already own for slightly improved visuals and a handful of extras. I really have not seen a single game that is honestly “next gen” gameplay and not just improved graphics. It always takes a good few years before developers truly get to grips with the hardware and start developing real “next gen” games anyway, and by then the prices drop and I’ll get into the next gen cheaper and when there are more worthy games out there. I really do not feel like I’m missing out on anything here. Last gen: I still have a few great games I’m playing through on last gen. I recently bought Fallout 3 & New Vegas, Oblivion & Skyrim all special editions with all the DLC included and I got them really cheap too. While I had previously played the games, I only played the vanilla versions and they took me a good while. So these versions with all the DLC included will entertain me for a good while yet. There are also other games I’m only now catching up on that I either missed previously or replaying as I really enjoyed playing them. That before I get into games on my PC and even iPad. Space: As I currently have set up under my TV a Playstation 3, Xbox 360, a Bluray player and even a PVR set top box. Oh and my internet hub. I really do not have the space for another machine right now. It already looks like an explosion in a spaghetti factory behind my TV with all the wires, power cables, HDMI cables, etc. No backward compatibility: This is not a big thing for most people, but it ties into the last 2 reasons of last gen and space. Seeing as I’m still playing games on the 360 & PS3, seeing as I do have a lack of space. If the new consoles did have backwards compatibility (the last ones did) I could get a new machine, replace my older machine and still play the last gen games I want to while not taking up any more space. Yes for some (including me) backwards compatibility is a big issue and a major selling point. Time: Tying into my previous point as playing through some last gen games takes up time. I also work fulltime and invest as much time as I can into this site too. Then there is the fact I have an amazing girlfriend I live with, a house to maintain…and a 7 month old puppy to take care of. Oh and we (the girlfriend and I) are at it like rabbits as we are trying for a baby too. I just do not have the time like I used to a decade ago when the last gen was in it’s early years. There are just more important things for me to spend my time doing and spending around £500 for a machine that is more likely to gather dust rather than be played on just seems inane. So those are the main reasons I have not gone next gen and to be honest, I really do not see these reasons changing anytime soon. Sure I could go out and buy a new console today…but why would I? I really do not think I’d play on it even if I did own one. I may get into the next gen in the future maybe when the prices drop, maybe if they start making worthy games, maybe if I ever have the time, maybe if I’m brave enough to untangle the mess of wires behind my TV. But as of writing, the next gen is just not appealing to me at all and I’m more than happy with my last gen machines and working on this site to get my gaming fix. This entry was posted in LBoG: Editorials and tagged Gaming editorials, Little bits of gaming, retro gaming, Retro gaming blog on 13/05/2015 by Steve Perrin.